The idea of an Open-All-Night Refuge or 'Ever Open Door' was first proposed by the Rev. George Albert Rogers at the Annual General Meeting of the Institution in 1867. 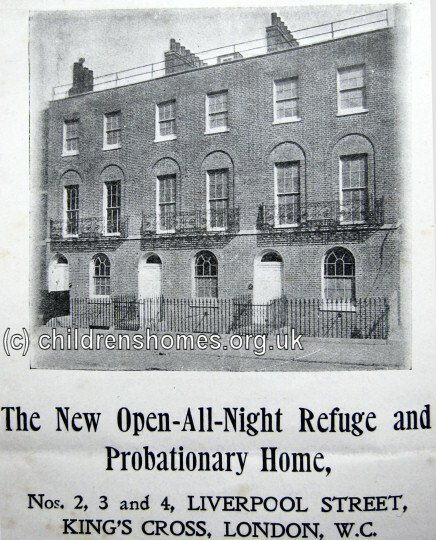 Such an establishment would provide for the immediate admission of both friendless and fallen young women and girls who were found destitute in the streets. It was suggested that if the Committee received £100 for the purpose, the experiment would be tried for a year. In due course, the comments were reported and read by a merchant, who sent £100 for the purpose but wished his name to remain unknown. He also gave a further £100 the following year to continue the scheme. 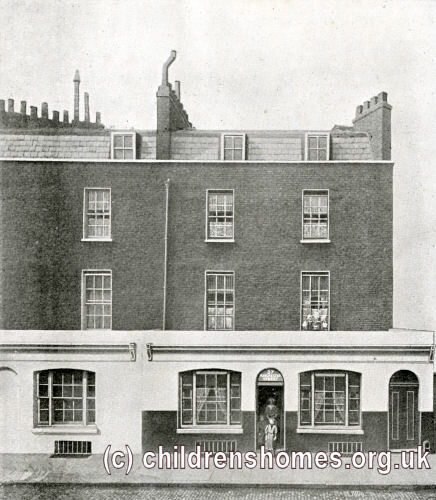 Two small houses at Fitzroy Place were rented to house the establishment and a matron was appointed. She had an assistant, part of whose duty it was to distribute invitations and tracts to women in the streets at night. The enterprise proved a success and in 1872 moved to 37 Manchester Street (now 47 Argyle Street), King's Cross, whose lease had been purchased. By 1910, the Open-All-Night Refuge had relocated to 2, 3 and 4 Liverpool Street (now Birkenhead Street). In the 1920s, the Institution's headquarters moved from 200 Euston Road to occupy 3 and 4 and Liverpool Street, where a training home was also located. After the Second World War, LFPRI changed its name to the London Haven for Women and Girls. The organisation was wound up in 1976, with its remaining assets being passed to the Rainer Foundation which later became part of Catch22. Galleries of Justice, Wolfson Study Centre, The Shire Hall, Lace Market, Nottingham NG1 1HN. Holds Rainer Foundation archives which include LFPRI material. London Metropolitan Archives, 40 Northampton Road, London EC1R OHB. (The Ancestry website also has LMA records relating to workhouses and other institutions — more details.) Has some records from 200 Euston Road (1907-47). The LMA catalogue notes "previous papers in parcel now missing".